Ring in the New Year with a Pillsbury Pot Luck - It's Gravy, Baby! My parents hosted a small get together last night to celebrate the new year. My dad turns 50 tomorrow! Justin told Bryson “Pop is going to be the big five-o!” and Bryson said “Pop is OLD! ?” Too funny! When we do parties, we like to keep it simple. You won’t find full meals or champagne. We like to go with easy foods like appetizers, finger foods, and desserts. 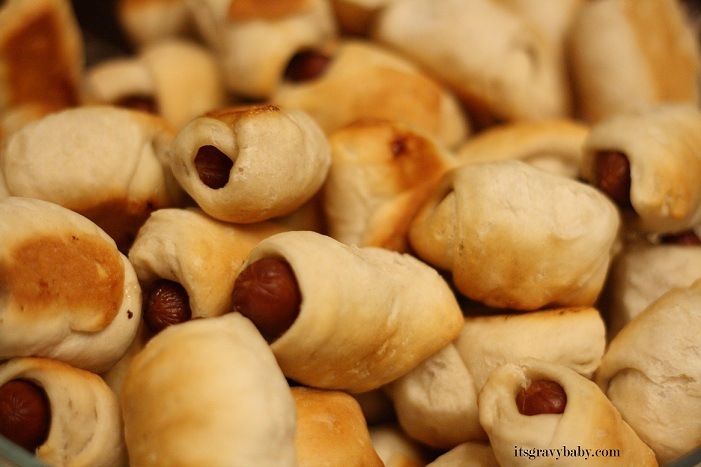 One of our favorite easy go-to snacks is pigs in a blanket. Tear each biscuit into 3 pieces and flatten out. So, if you have a can of 8 biscuits, you will end up with 24 pieces. Take each biscuit piece, place a cocktail weenie in it, and roll it up. Bake at 350 degrees until biscuits are brown, about 15 minutes. You can add cheese to them before baking. I like them plain, but I know some folks like to dip them in ketchup and mustard. For more ideas, visit the Pillsbury® Ideas Made Easy page. What are your go-to simple snack food ideas? The Pillsbury product, information, food ideas, online coupon link, and prize pack have been provided by Pillsbury through MyBlogSpark. We enjoy making meatballs in a tangy BBQ and pineapple sauce in the crackpot for a quick appetizer. Happy New Year.